Advent. We anticipate the celebration of the time in human history when God the son entered into his own creation. We wait in joyful hope for his second coming and the end of time. It is a time for prayer, reflection, and joyful penance. But most of all it is a time to turn back to the Lord. 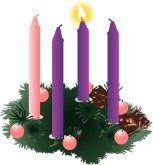 The priest, in his homily this morning, told of a Bishop who quipped that if it wasn’t for Advent he would be a pagan. Sometimes we need something to wake us up out of our complacent sleep. Although we are supposed to grow in the Lord every day in the green of ordinary time, we often lose our focus. Advent reminds us that the Lord is coming. We need to be ready. We need to prepare. In the Gospel Jesus warns us to “Stay awake”! We do not know when the Lord will return. We must, therefore, be prepared. Well we may not know when the end of the world and the second coming of Jesus will occur. But we do know that our life on this earth is short. Each of us will have our personal end of the world We do not know, generally speaking, when we are going to die.. As Christians, however, we do know that we are but pilgrims on this earth. Heaven is our true home. It is heaven that we must prepare for. And the only way to prepare for heaven is to prepare for death. 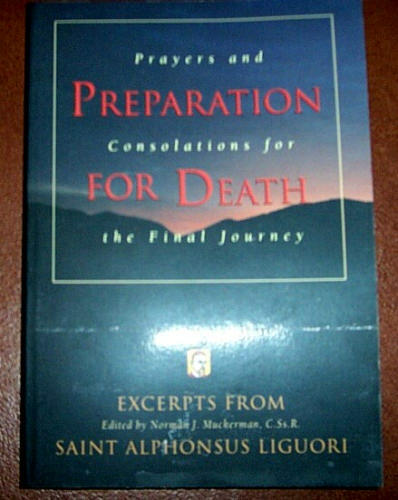 Several years ago, when I was still in my forties, a young man told me that he was very exited about a book by St. Alphonsus Liguori on “Preparation for Death”. I could not find the unabridged version, but I did find a book of excerpts. I read it but I was, umm, unimpressed. But now that I can see the cemetery from the house of my soul, I am rather drawn to it. I think that it is a perfect book to meditate on for Advent. It is my intention to post on the book throughout Advent. So let us ponder the words of St. Alphonsus as we audit our souls to determine if we are on the right path to holiness. In other words folks are you ready to die? Me? Not so much. I am not ready. Still struggling to be holy. Still falling short. I am not a very good friend to God. Sure I have lots of good intentions. I make God a lot of promises, but I don’t make good use of God’s gift of time. Somewhere in the basement, I think that I have a first place trophy for procrastination. Tomorrow is another day. Sigh. I may not have another day or another hour. But I don’t have to despair. God will give me the grace that I need to be His good friend. That is why Jesus gave us the Sacraments. I can confess. Repent. Do penance for my sins. And I can receive Jesus in the Eucharist. I ask for your grace and your love. Grant that your grace and your divine love may flourish in my soul wherein sin has previously abounded. Mary my Mother, my great advocate, listen also to my cry and pray to Jesus for me. This entry was posted in Four Last Things and tagged Advent, dying. Bookmark the permalink. 1 Response to First Sunday in Advent. Awake! Prepare!